sailboat. : A (not so) big night in! A (not so) big night in! A few weeks ago MoneySupermarket gave me £50 to spend on having a 'big night in' & although mine didn't go quite to plan, I ended up having a really lovely time in the end. I had been planning a super lovely night in with Mark with lots of yummy treats, some silly dancing and lots of laughter, but unfortunately he ended up having to work late and I can't lie, I was a little sad about that. Instead I decided to take the £50 (I did end up going a little way over budget, so I think I cheated a little, but ehh I had fun!) and treated myself to a relaxing night in with little Ralphie, because he always knows how to put a smile on my face if I'm feeling a little sad. 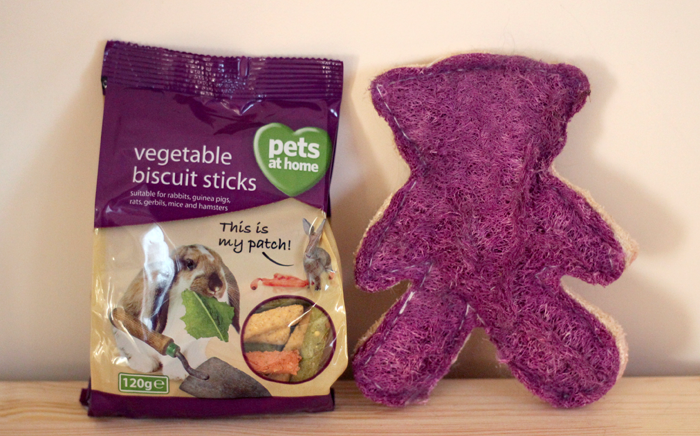 So firstly I stopped off at Pets at Home and picked up some of Ralphie's favourite treats, I think these vegetable sticks are like drugs for bunnies because he goes crazy for them and another little loofah bear because he pretty much destroyed the one he had before & he seemed to really love it! He usually hates most toys so if I find one he likes I have to repurchase. These two things came to roughly £5, which is a bargain price to pay for a happy bunny! I hadn't had a chance to play around with some new make up bits and bobs in what felt like forever because in the mornings I had been in such a rush to get ready I was automatically reaching for products I knew worked for me and I wasn't willing to try something new in case I had some kind of make up related disaster! Over the last few months Jouer make up has been getting a lot of incredible reviews and I had been really wanting to try something from the brand. Although I'm not including these in the £50 night in challenge, I wanted to talk about them because I stared my night by trying them out for the first time. I know the Jouer Matte Moisture Tint has been getting a lot of attention recently so when I was perusing Cult Beauty and I spotted the Jouer Luminizing Moisture Tint I knew I had to give it a try. I'm all about products that will help to give a healthy glow to the skin and for the warmer weather I always prefer a lighter coverage, so after furiously googling swatches and crossing my fingers the lightest shade would match my fair skin I placed an order. Of course I couldn't just get one thing so I also picked out the Jouer Cheek & Lip Tint in Honeysuckle and I managed to get free delivery by signing up to the Cult Beauty newsletter so my order came to £45, which definitely isn't cheap so I was expecting great things! At first I was a little scared the Luminizing Moisture Tint would be a little dark for me as it looked a tiny bit orangey when I put it on the back of my hand, but once I blended it in a little it ended up matching perfectly! I've used it a few times now and I think it's love! The Cheek & Lip Tint in Honeysuckle is a beautiful peachy shade and although I haven't tried it on my cheeks yet, I have used it on my lips. I found it a tiny bit drying but I think with some lip balm underneath it's actually quite nice. So far I think it's quite similar in terms of texture to the Stila Convertible Colours. I must say though, it's teeny tiny and you only get 2g which roughly half of what you get with a lot of blushes, so it's pricey but that's okay. I'm intrigued by Jouer packaging, it's designed so you can link together most of their products and make a custom palette. Unfortunately I don't have any other Jouer products to demonstrate this but I can feel a little bit of a brand addiction coming on, so watch this space. 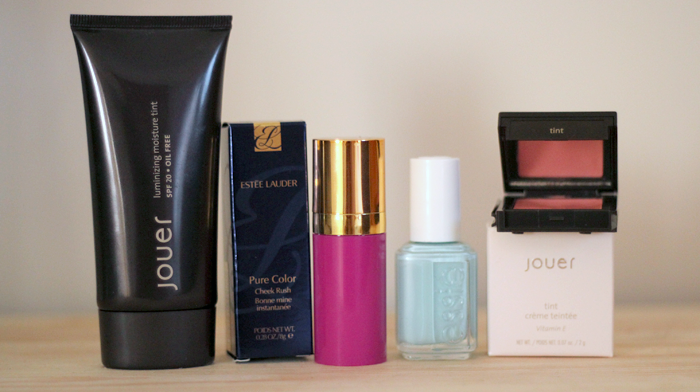 The Jouer Blushing Beauty Collection is currently firmly on my wish list! On my cheeks I wanted to try out one of the Estee Lauder Pure Colour Cheek Rush blushes♦, which I was very kindly gifted and this is the shade X-Pose Rose. I'm not really sure what I think of the packaging just yet, I like that it has a pump but you have to be careful not to dispense too much product. I love how this feels on the cheeks, it's so lightweight and it feels like it's going to be really long wearing too. I'll let you know how I get on with it once I've tested it for a little longer! After my little make up testing session was done I wanted to really relax. I had a mini sample of the Omorovicza Thermal Cleansing Balm that I got from What's In My Handbag that I hadn't tried yet, so after removing the majority of my make up with a micellar water, I cleansed my face. I do love a good cleansing balm and I have to say, this is one of the nicest I've tried. The full size is a pricey £46 and I'll need to test it out a little more to say whether I think I would part with that many pennies for it. I ran myself a bubble bath with the Badedas Original Bath Gelee, which I find is incredible at moisturising & soothing my skin, which has been super sensitive recently. I've also heard this is a great one to use just after giving birth so if you're expecting, this is perhaps one to try! After cleansing, as my skin needed a little a bit of a boost, I used the Montagne Jeunesse Dead Sea Mud Clay Spa mask, which is one of my all time favourites. 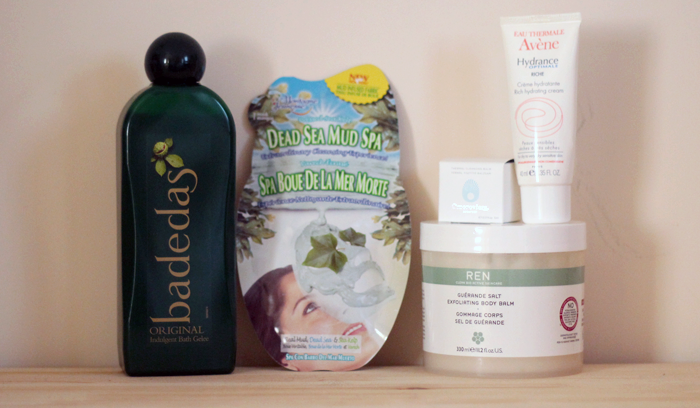 One of the most expensive treats I purchased was the REN Guerande Salt Exfoliating Body Balm. I've been through an entire tub of this and I loved it so much I couldn't resist getting another. At £20 it's much more than I would usually spend on a scrub, but as a treat it's really beautiful. What I like most about this scrub is how gentle it is, like I mentioned before my skin has been super sensitive recently and this helps enormously because it also gives a bit of added hydration. I gave my face a bit of TLC with the Avene Rich Hydrating Cream & settled down to give myself a much needed pedicure with Essie Mint Candy Apple nail polish, which is one of my all time favourite colours. 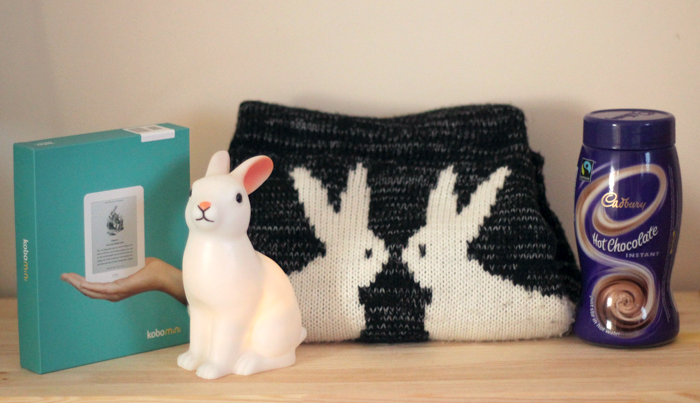 After my nails were dry I made myself a mug of hot chocolate, snuggled in my favourite cosy jumper, turned on my sweet little bunny lamp♥ & grabbed my eReader to read a few chapters of my book before going to sleep. So although my big night in perhaps wasn't as exciting as I had first planned, I felt super relaxed and I think it was just what I needed! Do you like spending nights in sometimes? How would you spend your Big Night In? Ahhhhh - you have just reminded my that I seriously need to do this, as well. Sounds fantastic! Bet you had a lovely evening! 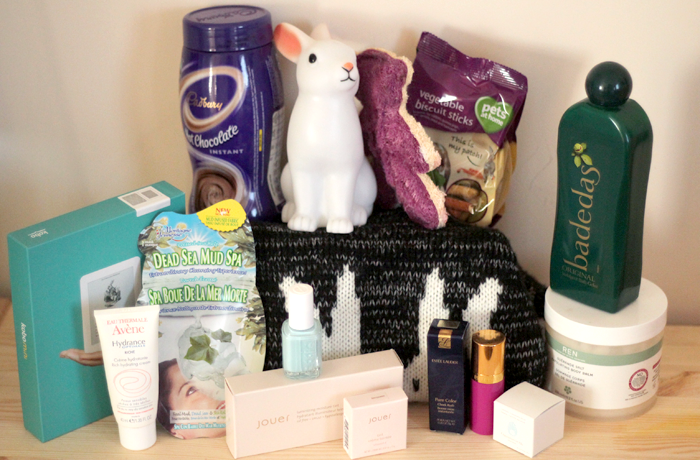 I also love all of your rabbit items like the lamp and jumper, they're adorable! Lovely post! Really want to try some of these products now! Love pamper evenings! You have so many bunny things! I love it! Sounds like you had a lovely night, sometimes pampering and 'me time' is the best. I love nights where I get to pamper myself and not have questions as to why I need six different skincare products from my boyfriend even though he's very understanding that he's not allowed to laugh when I'm wearing a face mask. The little rabbit treat is so cute, my rabbit's fussy too so I might try getting her one of those. I really don't know what I would do without my E-Reader on staying in nights! I just wished I liked baths more but they never turn out like the candle lit, bubbly images I get in my head! It looks like you had a lovely night in, sometimes they are much better than nights out! I love cadbury hot chocolate too! I love a night in!! These look like great products! Aww this sounds lovely. My big night in didn't go to plan either! I was going to have my mum and stepdad over to treat them to dinner but my stepdad had to work a funny shift so I had to improvise at the last minute! I love your little bunny lamp! I might have to get one of those for the nursery as it's currently (inadvertently) developing a british woodland theme! I paint my nails too, as I'm so rubbish at doing them, I normally need a good few hours to paint them and then sit there waiting for them to dry. Fab stuff, this would definately make a great night in, I love a good pamper sesh, especially the opportunity to play with new makeup. Make Up: Some Summer Favourites! A lovely skin care duo from Amie. July 2013 GlossyBox: The Seaside Splash Edition. Five Things & Five Blogs I Love Friday #43! Yesterday's Oh Yay's & Oh Dear's! Memories of the first I love you. In my make up bag #1! Super Sweet Miniature Photo Canvases! Oh July: A few things I'm looking forward to!